It's always very nice to wake up and see your own professional working field win a Nobel Prize. I am very happy to note that this year's prize in chemistry has been awarded to Martin Karplus, Michael Levitt and Arieh Warshel for their development of "multiscale methods for complex systems". More simply put, these three chemists have been recognized for their development and application of methods to simulate the behavior of molecules at various scales, from single molecules to proteins. The work sheds light on phenomena as diverse as protein folding, catalysis, electron transfer and drug design. It enables chemists like me to calculate a variety of things, from the rates of chemical reactions and the stability of molecules to the probability that a drug will block a crucial protein implicated in a disease. I will have a more detailed post on the prize later but for now it's worth noting that more than many other Nobel Prizes, this one recognizes afield rather than a particular individual. It really tells you how pervasive modeling and calculation have become in solving all kinds of chemical problems. In addition for all three chemists it's really a lifetime achievement award rather than one for a specific discovery. Computers have been applied in chemistry since the 1960s. They were a direct outgrowth of theoretical techniques that calculated all kinds of molecular properties, from a molecule's stability and movement to its reactions with other molecules. For the longest time these calculations could be done only for simple systems, and it was only in the 90s or so that computing power and algorithms began catching up with theory to enable the application of calculations to large, practically relevant molecules like proteins, drugs and materials. It was Karplus, Warshel and Levitt among others who made this possible. This year's laureates have developed and applied every kind of theoretical technique, from strictly quantum mechanical calculations to highly parametrized classical and semi-classical ones based on empirical data, to simulating a vast number of diverse molecules. They have also developed software that brought these computations to the masses. The quantum mechanical methods are often called 'ab initio' - from first principles - and were already recognized with a prize in 1998, but this prize honors something much broader. Techniques developed by the trio include molecular dynamics (MD) which tries to simulate the real life movement of complex entities like proteins, along with electrostatic calculations which try to calculate the attraction and repulsion between charged atoms and molecules. Martin Karplus is sort of like the godfather of the field- he was Linus Pauling's last graduate student - and there's not an area of molecular simulation which he has not touched. Undergraduate chemistry students would know his name from the so-called Karplus equation that allows you to relate magnetic resonance properties of molecules to their geometry; now they will find out that he is more than a textbook relic. Warshel and Levitt have made key contributions at the boundary between quantum mechanics and classical mechanics. All three of the recipients have mainly become well-known for simulating the behavior of small organic molecules like drugs and proteins, but their techniques have also been equally applicable to materials like zeolites and solar cells. As with many Nobel Prizes there are a few other individuals who have contributed enormously to the field who were inevitably left out. Although little known outside the field, my personal list would include Norman Allinger, Andrew McCammon, Ken Houk, Roberto Car, Bill Goddard and Michele Parrinello. Foremost in my mind is University of George chemist Norman Allinger. Allinger was the first person to widely develop and apply the force field approach that underlies much of this year's work. 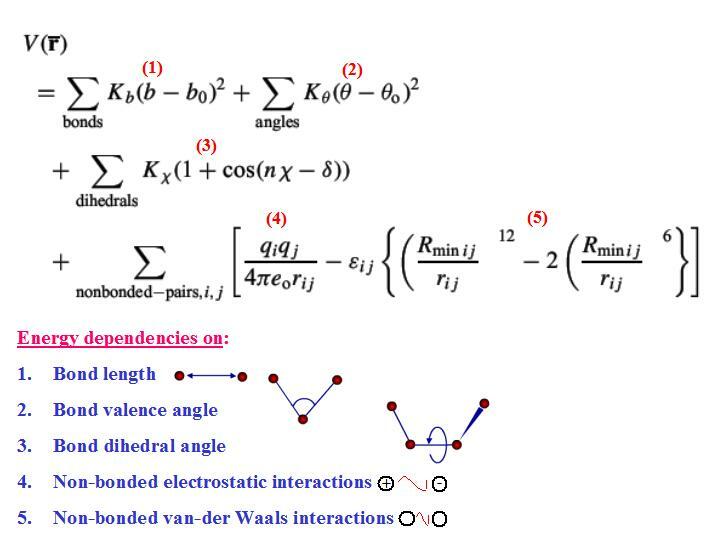 A force field is basically a set of simple equations for describing the bonds, angles, torsional (rotatable) angles and long-range non-bonded interactions in a molecule (see illustration above). It is a simplified model based on classical mechanics which regards atoms and bonds as balls and springs. Because it is a simplified model it needs to be shored up with parameters from experiment or from rigorous quantum mechanical calculations. Allinger developed two very widely used versions of a force field initially called MM2 (the method itself is called 'molecular mechanics, MM'), spent years carefully parametrizing and benchmarking them and then applied them to a variety of molecules. Karplus, Warshel and Levitt applied these ideas but also developed their own, and then went much beyond the initial work by creating hybrid methods that combined classical with quantum mechanics ("QM/MM"). This is a major part of the prize announcement; it took a lot of efforts to refine and troubleshoot such methods and make them accessible to non-specialist chemists. You could use the quantum mechanical technique for describing the core part of a molecular system and then use the classical part for simulating the rest of it. Among other things this would enormously save time, since doing a quantum mechanical calculation on the entire system would be prohibitively expensive in terms of time. The three chemists have also developed purely classical methods to simulate molecular motion. These days most of us who do the calculations take this work for granted, so thoroughly ingrained it is in the language and tools of computational chemistry. This year's Nobel Prize really recognizes many other things connected with molecular modeling. First and foremost it is a prize for the field rather for individuals, a signal from the Nobel Committee that computational methods have come of age. You would be hard-pressed these days to find papers that don't include at least some computational component, from the simple visualization of a molecule to very rigorous high-level quantum mechanical calculations. The prize is also a testament to the amazing growth of computer hardware and software in the last two decades without which such calculations could never have become practical; today my desktop can do in a day a calculation that would have taken a few days on a supercomputer in the 90s. The award also recognizes how scientists can understand matter at many different levels, from single molecules to complex assemblies of interacting molecules which may demonstrate emergent behavior. But perhaps most importantly, the prize recognizes the key role of models in enabling the growth of chemistry, and other disciplines for that matter; computational chemistry models in fact share general principles with models in climate science, ecology and economics. I am not so optimistic as to believe that computers can possibly supplant any human scientist even in the distant future, but the prize tells us that a carefully constructed model that recognizes its strengths and limitations can stand shoulder to shoulder with a competent chemist in attacking a thorny problem. Together experiment and modeling can make a difference. Update: A (mostly) healthy debate over the value of molecular dynamics (MD) simulations has broken out in the comments section of In the Pipeline. I will have much more to say about this later but for now it's worth noting that there are two separate issues here; the validity of MD as a science and the validity of a Nobel Prize for computational chemistry. The latter is often a field-wide recognition that is given for utility rather than fundamental scientific insights.